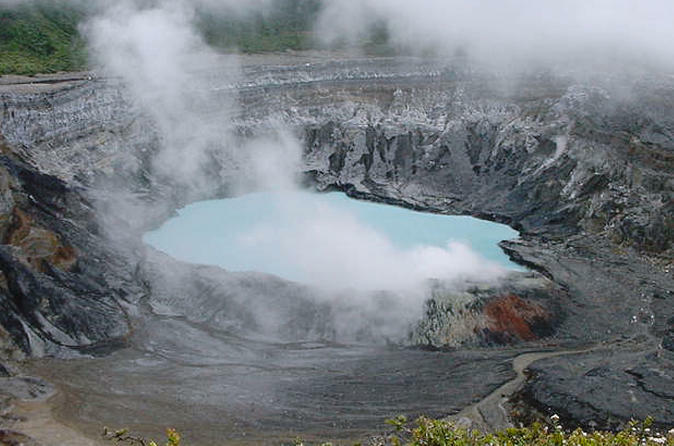 See one of Costa Rica's most magnificent natural wonders up close with a morning tour to Poás Volcano from San Jose. View steaming sulfuric vents from the active main crater that juts majestically into a cloud forest, and hike to beautiful blue Botas Lagoon while exploring the surrounding ecosystem. Throughout the day, learn about Costa Rica’s prized coffee industry and drive through the strawberry and flower farms of the Central Valley. After morning pickup at your San Jose hotel, drive north from the capital in an air-conditioned minivan. While traveling along the Pan-American Highway toward the city of Alajuela, pass by urban attractions including Mango Park, the Monument to Juan Santamaria, and the Agriculture Monument. Stop to learn about Costa Rica’s thriving coffee industry and the so-called ‘golden bean,’ and get a glimpse of other important agricultural industries while passing strawberry, fern, and flower farms. As you approach Poás Volcano National Park, the plains of the Central Valley start to slope upward, the temperature noticeably cools, and the surrounding vegetation changes to that of a cloud forest ecosystem. When you reach the lip of the active main crater, gaze down on the acidic lagoon that fills it and watch steam pour out of sulphur fumaroles. Poás has erupted dozens of times in the last two centuries but has not shown signs of major activity since 1954, so visiting is considered safe. You can also enjoy sweeping views of the Central Valley from the volcano’s impressive elevation of 8,885 feet (2,708 meters). Hike along a trail to reach a second lagoon, learning about the park’s unique cloud forest ecosystem along the way. Serene Botas Lake fills an interactive crater surrounded by a lush green forest, thanks to the absence of any corrosive gases. Hike back to the minivan and relax on the return ride to San Jose, where the 5-hour tour concludes in the early afternoon.